Members of our team were ringing at St Nicholas Bradfield this afternoon and afterwards we enjoyed a really nice evening meal in the Old Horns Inn next to the Church. Some of our ringers were in Staffordshire today on the Branch ringing outing. On the way down through Derbyshire we called in to have a ring on the privately owned Little Eaton Campanile, 12 bells mounted in the roof of a garage with a Tenor of 1cwt 1qtr 11lb. Then on to Staffordshire and a ring on the heavy 6 at Hoar Cross. Next was Yoxall before lunch. Our dinner time pub was the Olde Peculiar in Rugeley for pre-ordered food and drinks. Afternoon ringing started at Mavesyn Ridwarefollowed by Armitage and finally Kings Bromley. A Quarter Peal of 1282 Cambridge Surprise Royal was rung on Sunday afternoon by a team of ringers on their quarter peal weekend. Called Geraldo's 2015 "Yorkshire" QP Weekend, details of the Ecclesfield quarter and the others rung by the team during their weekend are on Bellboard, use this link to see them. Some of our team joined in ringing at the Thrybergh practice night tonight. Ringers from Beighton and Wortley also there. A good evening of ringing ranging from Rounds and Call changes to Cambridge Surprise Minor. The Yorkshire Association of Change Ringers was holding its general meeting in our area today. 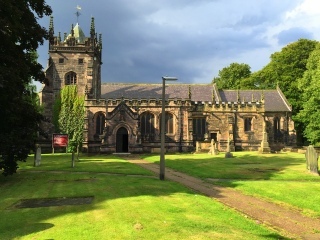 Ringers from all over Yorkshire were able to ring at Hoylandswaine, Penistone, Wortley, and Ecclesfield before a service, tea and meeting at St Mary’s, Rawmarsh. Many people turned up to ring at Ecclesfield, at one point over 30 ringers were in the ringing chamber. Some of our ringers were at the YACR Sheffield Branch joint ringing meeting with Chesterfield District ringers at St Mary Magdalene Church, Whiston this afternoon. To the accompaniment of torrential rain and thunder we had a good couple of hours ringing on the 8 bells. On Saturday afternoon members of our team joined others from the Branch ringing at St James the Great, Norton. This 8 bell tower has a new ringing gallery where the ringers stand to ring the bells. Norton had always been a ground floor ring, the ringers ring from the ground floor at the back of the church. Following extensive work to install a kitchen and DDA toilet in the tower area the ringers are now on the top of these rooms higher up but still visible to the congregation. It’s a much better ringing experience, easier to handle the bells and more space. One wall of the gallery is a lovely stained glass window. We went to have a ring from the new gallery. Following the ringing Norton Tower Captain had arranged a barbeque for us all at his home. It was a sunny evening, food was great and we chatted into the evening with our ringing friends from the Sheffield Branch. The bells were ringing on Saturday evening by ringers who were on the Storthes Hall Summer Ringing Course weekend. Over 35 ringers turned up to have a go on our bells. Many favourable comments were made about the bells and we enjoyed having our visitors. Peal on VE day to commemorate the 70th Anniversary of the end of WW2. Our ringing friends at St Leonard’s Wortley held their ringing outing today. 4 of us joined them for the day. We rang at 4 towers, All Saints’ Madeley, St John’s Keele, St Margaret’s Betley and St Bertoline’s Barthomley. We also had a ring on a private mini-ring belonging to Phil and Rowena Gay. A nice lunch was had in the Hand and Trumpet pub in Wrinehill and we finished the day in The White Lion at Barthomley. Madeley, Keele and Betley are in Staffordshire and Barthomley is in Cheshire so we rang in 2 counties in 1 day too. 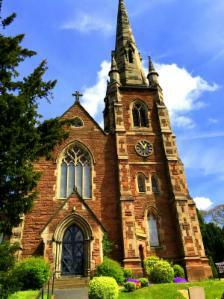 The photo is St John’s, Keele. Some of our team were ringing at 2 towers this afternoon along with ringers from the Sheffield Branch of the YACR. 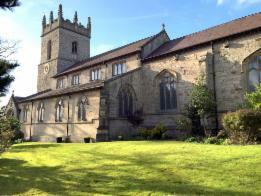 First tower was the 6 at St James, Barlborough. The second was the 8 bell tower of All Hallows, Harthill. The photo is Barlborough Church. The bells were ringing this morning to welcome people to the coffee morning in the Church but it wasn't our team on duty. We were pleased to have the Sheffield Universities Guild of Change Ringers visit us on their ringing outing. We were their first tower of the morning and after leaving us they were going to St Leonard's Wortley to ring on their 8 bells at 11am. After Wortley the tour continued heading for St Nicholas Bradfield, another 8 bell tower to be followed by lunch in The Old Horns Inn. SUGCR are holding thier The 56th annual dinner this evening at Tapton Hall, Sheffield. Members of our team were ringing at the two Cathedrals in Sheffield today. It was the AGM of the Sheffield Branch of the Yorkshire Association of Change Ringers. Joined by ringers from towers in the Sheffield and Rotherham area we had a ring on the 8 bells of St Marie’s Catholic Cathedral on Norfolk Row. This was followed by the AGM and ringers’ tea of hot pies and mushy peas. In the evening we were ringing at Sheffield Anglican Cathedral on the 12 bells there. A Happy and Peaceful New Year to Everyone from the Ringers at St Mary’s Ecclesfield. As you may have heard if you live locally, we rang out the old year and after striking the 12 blows of midnight we rang in the New Year. All 10 bells sounding out over Ecclesfield signalling the start of 2015. As usual we celebrated with some champagne and fired off a few party poppers. Keeping this tradition going is important to us, ringing in the new year with tower bells is done at countless numbers of churches throughout the UK and world-wide. Photos taken after ringing at midnight of the ringers who rang the bells.